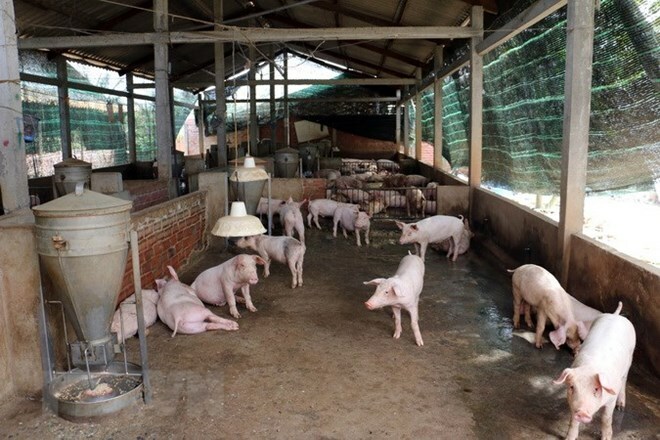 Bac Kan (VNA) – The northern mountainous province of Bac Kan has become the second locality in Vietnam to declare the end of the local African swine fever (ASF) outbreak. On March 13, Ngan Son district reported an ASF outbreak after a pig farmed by a household in Thom Ta hamlet of Thuong Quan commune died on March 9, testing positive for the fatal virus. Local authorities immediately took actions to prevent this disease from spreading. At the meeting to announce the ASF-free status on April 12, Deputy Director of the Bac Kan Department of Agriculture and Rural Development Nguyen Ngoc Cuong said that although no new outbreaks have been reported over the last 30 days, the province has still issued warnings and increased forces to prevent the recurrence of ASF. Animal husbandry is an important sector in Bac Kan, which farms about 181,000 pigs at present. Hoa Binh province had previously declared its ASF-free status on April 9. Since ASF was first recorded in Vietnam on February 1, the disease has spread to more than 20 provinces and cities. According to the World Organisation for Animal Health (OIE), ASF is a fatal infectious disease that spreads rapidly among pigs but does not affect humans. The only known preventative measure is a mass cull of infected livestock.